In typical Malaysian fashion, the sun that had shone until half an hour before the start of the MotoGP race was replaced by a sudden heavy thunderstorm that did not last long but left the track completely soaked. 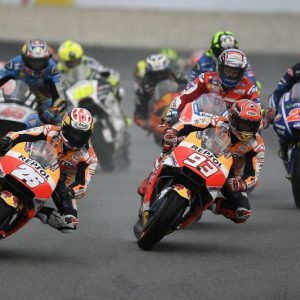 , and when he realized that he could not match the pace of the three frontrunners, he settled for fourth place which, combined with the achievements of Dani Pedrosa and Cal Crutchlow this season, earned Honda the 2017 MotoGP Constructor title. It was the manufacturer’s 23rd such crown in history, and the sixth out of the last seven seasons. With Dovizioso winning the race in front of Jorge Lorenzo and Johan Zarco, Marc will arrive at the season finale in Valencia leading the standings by 21 points over the Italian. Pedrosa, who had been the fastest rider in Saturday’s dry conditions, wasn’t the happiest man when the rain started to fall, but a completely different setup prepared by his team, and the decision to use a soft rear tyre, allowed him to keep a decent pace and take fifth place, just behind his teammate.